In these dry conditions, fresh produce will quickly lose both freshness and visual appeal as its natural moisture is lost into the surrounding atmosphere. The relative humidity around the display is raised to around 95% and as the water droplets quickly evaporate, the ambient temperature of the air will be reduced. This adiabatic effect is often called ‘evaporative cooling’. 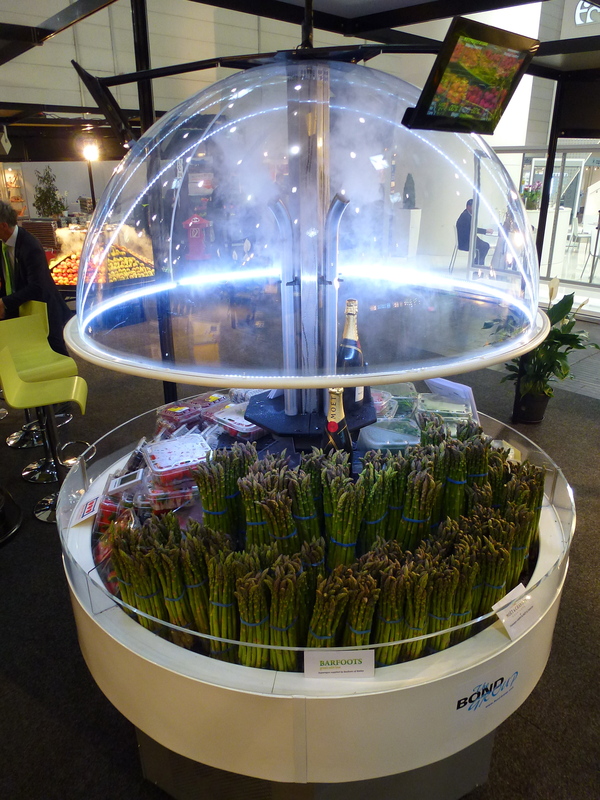 The fresh produce will no longer lose its own moisture into the ambient air and is additionally cooled, without getting wet. 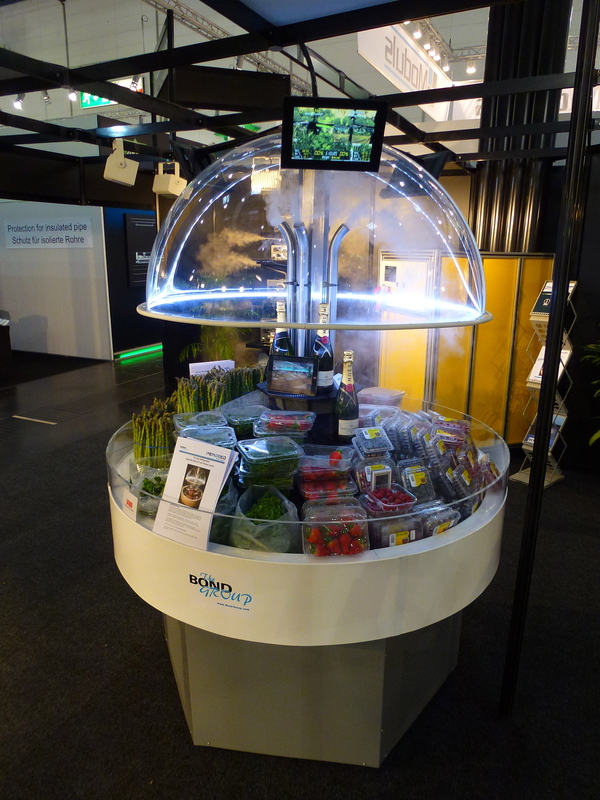 At EuroShop 2014 in Dusseldorf, Pendred Retail launched a unique Speciality Produce Counter. 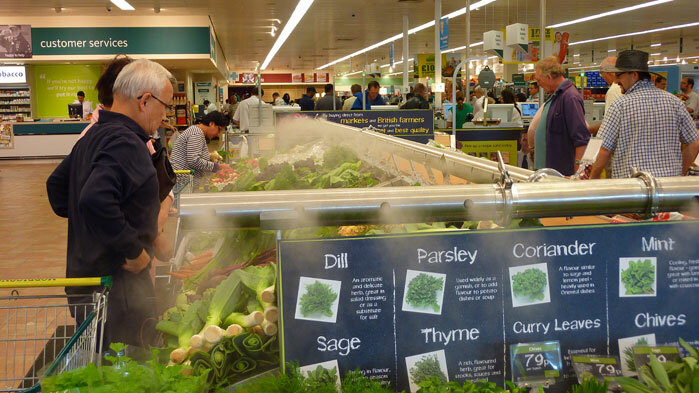 The counter is refrigerated and has been designed to be a focal point within a store, attracting attention but with the benefits of Tru-fog, which maintains and improves the quality of the product being displayed in the counter – giving amazing results. The counter certainly attracted attention at the exhibition, visitors to the show could not help stopping at the stand to take a look and ask questions. 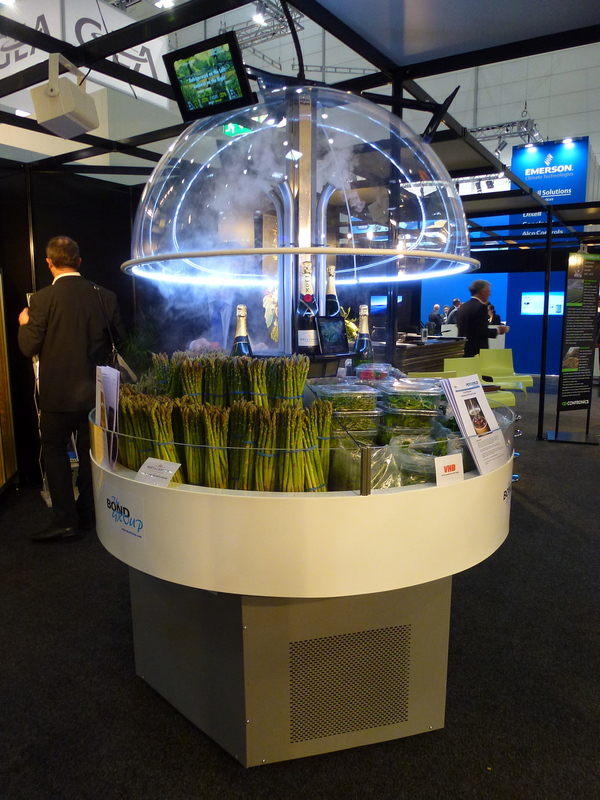 The effectiveness of the Tru-fog was evident throughout the exhibition, as the berries, asparagus and leafy produce displayed on the counter looked fresh every day – even on the last day – and the asparagus had grown in size! We are very pleased that the counter was selected as one of the “Highlights of EuroShop” with an image being placed on the “Highlights Page” of the EuroShop website. If you are interested in introducing the Pendred Speciality Produce ‘Dome’ Counter to your restaurant, store, supermarket, shop, hotel etc then please contact Lesley Hunt on Lesley@pendred.com. The maintenance of natural moisture in fresh meats is essential to ensure, freshness, taste, texture and appearance. Unfortunately meat can rapidly dehydrate under normal refrigerated counter conditions, taking only a few hours to become dark and unattractive. This creates a large amount of wastage, as a dry appearance seriously affects salability. An efficient humidification system will neutralise the premature drying effect of refrigerated air and minimise dehydration from unwrapped fresh meat. Natural moisture loss is reduced by over 60%, display life is extended from 3-5 hours to 36-48 hours, while product freshness and appearance are maintained. During the Meat Maturation process the maintenance of moisture is also of paramount importance, if the best quality product is to be consistently produced. Moisture loss often exceeds 4% over a 7 day period, which represent nearly 3Kg in weight loss from a 65Kg carcass. This moisture/weight loss would normally be reduced by around 60%, saving around 1.6Kg per carcass. A number of systems are available for maturation rooms and temporary maturation trailers. A further benefit of ‘humidity-controlled’ maturation is that boning and cutting of meat is made easier due to the improved condition of the outer layer of the meat. This further reduces wastage when carcasses are cut into primals. 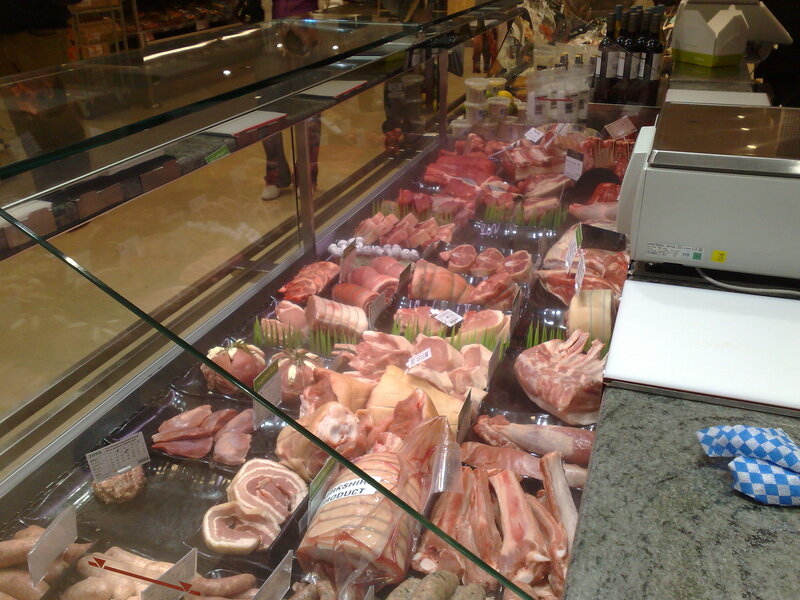 We are able to offer a number of Moisture Maintenance Systems for unwrapped Fresh Meat counters including Ultrasonic Fogging, Atomisation & Ultrasonic Humidification. The most suitable installation is determined by the type of product and the individual situation. Also a variety of humidification equipment can be retro-fitted into existing permanent or temporary meat maturation rooms. The mucus coating on the outer layer of fish’s skin plays a very important role in maintenance of quality and the degradation of the product. Once caught the protective mucus layer begins to break down. Causing a steady decline in the appearance of the fish as it loses its natural sheen. The breakdown of this layer is also the main contributor to those familiar bad odours. Through maintaining a sacrificial layer of moisture on the surface of the fish, it is possible to preserve the mucus coating and that ‘just caught’ look. This not only enhances salability but also reduces the surface temperature of the product, through evaporative cooling, and diminishes moisture loss. Therefore shelf life is increased. 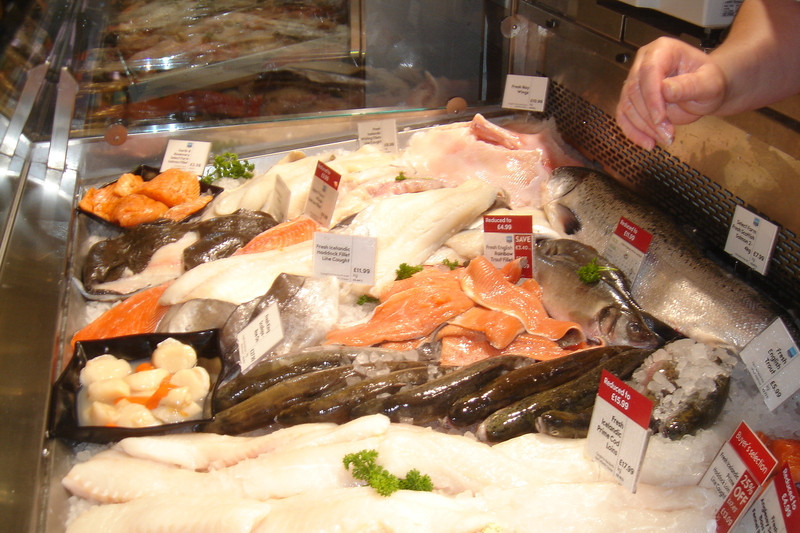 We also offer Misting for Fresh Fish and Meat. With the storage of cheese humidity needs to be carefully controlled, with sufficient moisture to stop the cheeses drying but not so much that surfaces are wetted and unwanted moulds are allowed to form. The storage and maturing of the many types of cheeses needs special conditions and considerable expertise. 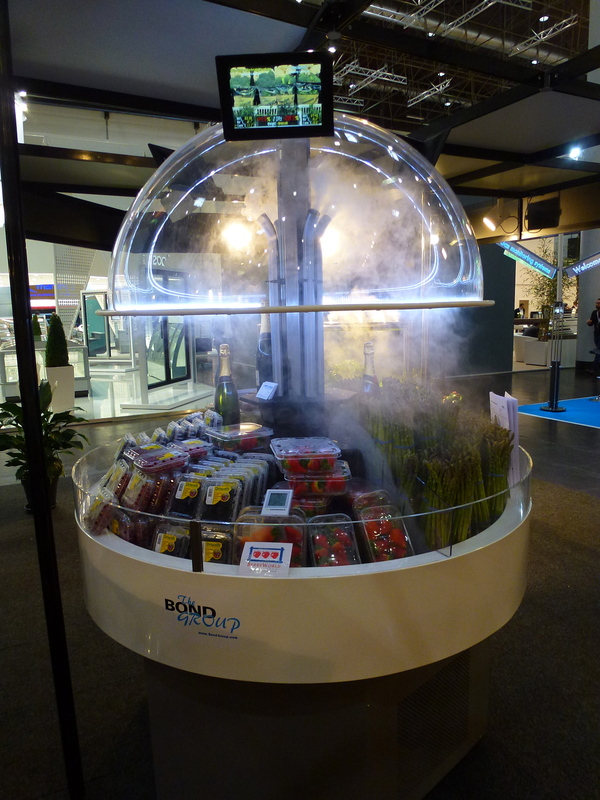 The two main elements of a controlled environment are temperature and humidity. While the need to control temperature has always been appreciated and is generally well achieved, the control of humidity has proved more elusive. In part this is due to the fact that the correct combination is perceived as difficult to achieve, hence, for example, cheeses in display cabinets are nearly always wrapped to prevent them drying and losing quality. This is because any form of refrigeration also acts as a dehumidifier. People may argue against this, and indeed the effects can be reduced by such techniques as slow fan speed and running a wet evaporator coil, but it does not get away from the fact that passing air through a cold evaporator will produce dry air looking to absorb moisture, in this case from the cheeses. This means that humidity has to be introduced to counteract the problem. 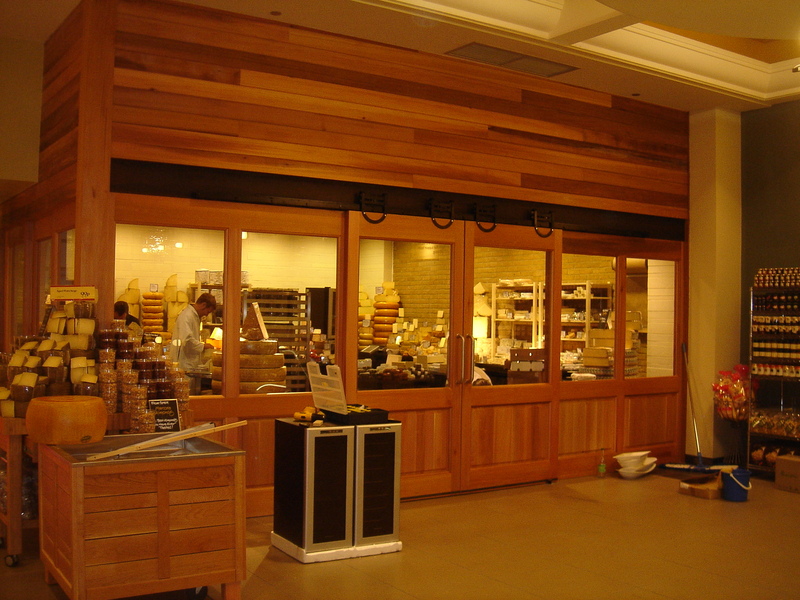 The situation applies to maturing rooms, storage rooms display cabinets and even the environment within a shop. Norman Pendred & Company have the best answer in the form of ultrasonic humidifiers. Essentially an ultrasonic humidifier produces a fog of ultra fine droplets as small as 1 to 3 microns which can be introduced in a controlled way into any area to raise the relative humidity. Because water quality varies so much, especially with regard to degrees of hardness, it has been found that filtration and the use of Reverse Osmosis is essential both to preserve the life and effectiveness of the humidifier, as well as ensuring the purity of the moisture being introduced. Norman Pendred & Company can provide a proven and reliable solution to almost any storage or display problem.